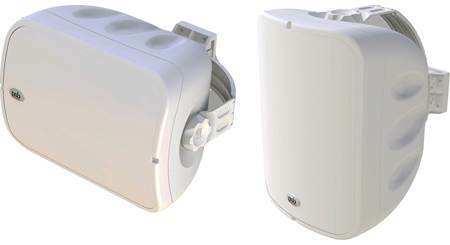 The PSB CS1000 outdoor speakers are built to provide amazing sound quality in the most challenging environments. The PSB CS1000 outdoor speakers are built to provide amazing sound quality in the most challenging environments. These weather-proof speakers deliver crisp highs with their 1" titanium dome tweeters. And the 6-1/2" woofer pumps out deep bass with a forward facing port and a plug you can remove to add bass punch. 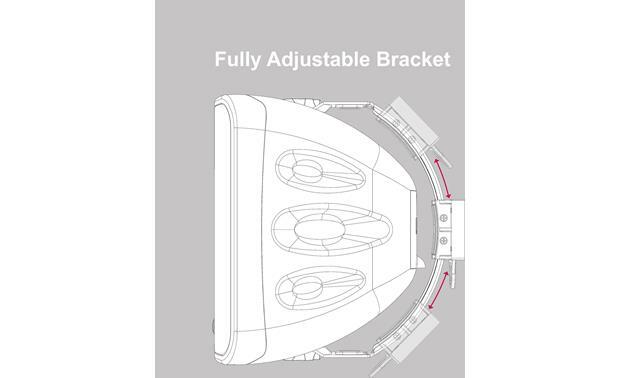 Each CS1000 has a bracket that lets you mount it horizontally or vertically. Once mounted, each speaker can be swiveled to direct the sound wherever you like. PSB Canada knows as much about harsh weather as they do about high fidelity. The sturdy interior of the CS1000 cabinet features extensive bracing to put a damper on vibration. All materials are tough enough to withstand temperature and moisture extremes. Other protective measures include their UV resistant enclosure, rust-proof speaker terminals and rubber seals and gaskets. These speakers will provide years of music enjoyment whether you're out listening on your urban terrace, on the boat dock or just cooling off in your toddler's pool. I have a 20' x 45' outdoor pool area. 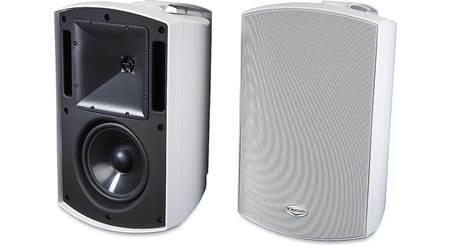 Will one pair of these speakers provide enough sound or do I need more than one pair? Thanks! Absolutely. One pair is all you will need. Make sure you have a good amp - I recommend NAD. 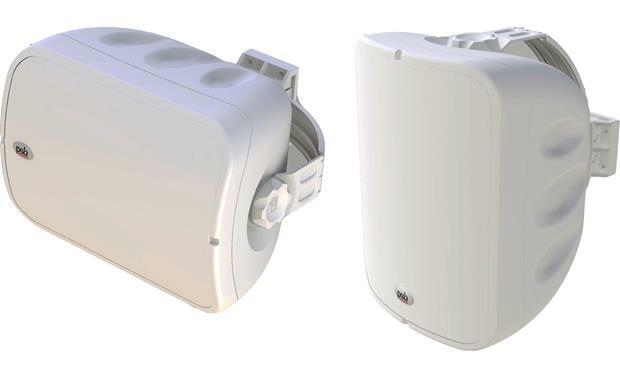 All-Weather Outdoor Speaker: The all-weather, outdoor PSB CS1000 loudspeaker is specially designed to bring PSB's renowned sonic performance to wide-open indoor or outdoor spaces. Two-Way Speaker Design: The CS1000 outdoor speaker's two-way system includes a 6.5"woofer with a clay/ceramic injection-filled polypropylene cone and rubber surround that complements a 1" titanium dome tweeter to deliver full-range music reproduction. 1" Tweeter: The CS1000 feature a single 1" titanium dome tweeter with a ferrofluid neodymium magnet. 6.5" Woofer: The CS1000 features a 6.5" clay/ceramic filled injection-molded polypropylene woofer with a rubber surround. Waveguide: The CS1000's tweeter utilizes an acoustical waveguide to deliver, more even high frequency response. Crossover Network: The tweeter and woofer are crossed over at 2,200 Hz. Weatherproof Design: The PSB CS1000 features a rugged, weatherproof design to bring high-end audio performance to any outdoor environment or commercial installation. Durable Build: The CS1000's durable build features a thick-walled UV-resistant polypropylene cabinet, an aluminum grille, and rustproof terminals with a rubber cover for protection from the elements. Bass Reflex Cabinet: The CS1000 utilizes a bass reflex cabinet with a front firing port for greater efficiency and bigger bass response. 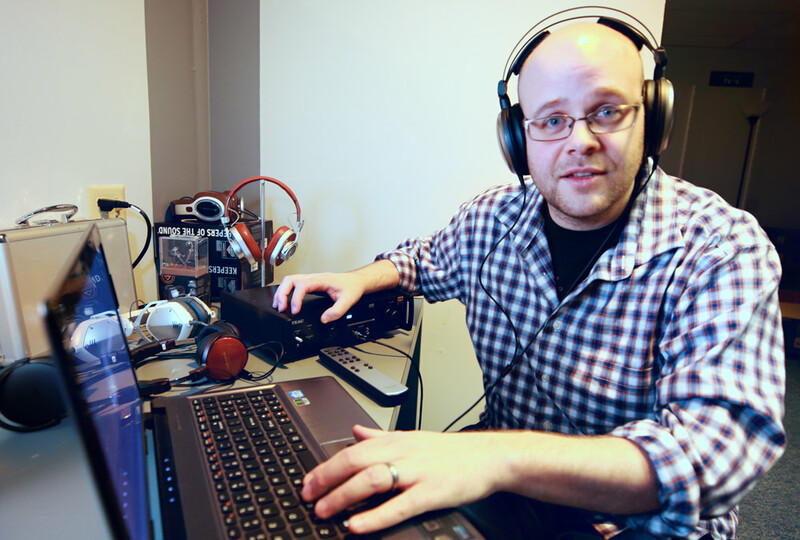 A rubber phase plug is also provided for tighter, accurate bass reproduction. Internal Ribbing: The CS1000's cabinet utilizes extensive internal enclosure ribbing for extra stiffness to prevent resonance. Aluminum Grille: The speaker comes with a removable aluminum (metal-mesh) grille. 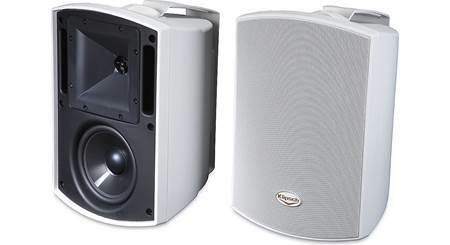 Paintable Finish: The PSB CS1000 outdoor speaker is available in a black or white finish. The enclosure and grille are both paintable. Gold-Plated Binding Posts: The gold-plated binding posts will accept bare wire (16-12-gauge), pin connectors, spade connectors, and banana plugs (single only). The speaker terminals are spaced to far apart to use dual banana plugs. Terminal cover: The CS1000 includes a rubber terminal protective cover to protect the speaker's gold-plated speaker terminals from the harsh elements of the outdoors. Applications: The PSB CS1000 is the ideal speaker for a range of residential and commercial environments, including decks and patios, retail stores, restaurants, hotels, and fitness centers. Dual-Rotational Bracket System: PSB engineers designed a fully adjustable, dual-rotational bracket system to allow for multiple mounting options, even in difficult places. Thanks to this highly flexible bracket, the CS1000 can be mounted vertically or horizontally and rotated up to 90 degrees on one axis and 170 degrees on the other axis. How do these compare with the Def Tech 6500s? How will it sound with the port plugged? I have one plugged that's a bit more exposed to weather, and one unplugged that's more protected. You get a bit more boom in the bass feel unplugged, but the difference is nominal in my opinion. I think these are great speakers. The low end is not as defined or strong. You would definitely notice it if you compare before and after. Don't think it would make you think "These are awful" every time you listen to music. Also, not sure how important the plug is if the speakers are sheltered and angled down somewhat. I think the issue the plugs solve is wind-driven rain getting past the screens and into those cavities, not just moisture and humidity. Is it not recommended to run 4 of these in parallel to the same amp? I noticed that the minimum impedance is 6 ohms in the detailed spec sheet pdf. One pair will be enough unless you have more than 20 people in your pool at one time. I have one pair of speakers powered by an amp that is only 45w x 2, and they fill my back yard. Aprox 40' x 100'. 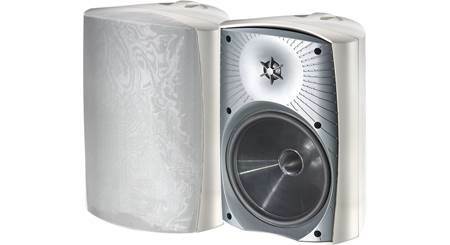 They are great sounding outdoor full range speakers! We used a pair in a space that is bigger than this - and it's pretty good. Seems, the base becomes lost the larger the area. These replaced a set of Bose outdoor speakers and they're definitely an improvement. There is only so much you can do without infuriating the neighbors! Waiting for more wireless options. You shouldn't but it really depends on what you are driving them with and location. I am using a Niles 1230 with the speakers mounted against my house and they sound amazing. If I crank them everyone on my block can hear them. Those speakers will be fine as long as you mount them 8-10' up on the house and point them both inward 40 degrees or so. You will hear the sound across the length of the pool, but the sound will obviously be better at one end than the other. With 2 pairs it will be better and when you are in the middle of the pool you will enjoy music from both sides -similar to a concert. These speakers sound good half a block away from the deck I have them mounted on! One pair should be more than enough. is PSB CS1000 compatible with EOS amplified? These should work fine with the EOS. 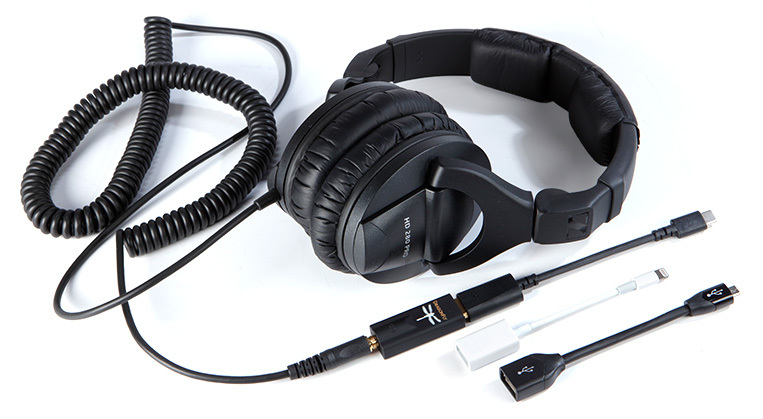 You will connect from the speaker output on the EOS to the speaker inputs on these. I work at an exclusive Country Club. We need to replace our outdoor speakers which are connected to our house sound system. Our porch is 70 feet long. Would two of these be sufficient? Our current system for the Club is 5 zones, each powered by QSC ISA300Ti amplifiers. Also, we have live music outside once a week. We would like to be able to link into their sound system so that the music could be playing inside the club. How can we do this? Searches related to the PSB CS1000 Outdoor speakers.